Meister Eckhart's vision of religion is remarkably beautiful and simple. This enlightened master strips away the unpleasant and tedious bits of religious dogma and turns them into a mystical harmonious song. For the most part, Christian religion or rather its supposed spokespersons tend to focus on grave matters, such as penance, suffering and death. There is often too much emphasis on the pain and suffering that Jesus had to endure to wash away our endless and never-ending sins, alongside the harsh judgments that God will bestow upon us in the afterlife, the everlasting burning flesh and spirit that would await us if we stray from the righteous path. In fact, God's eyes and ears are always following us at every turn of life, evaluating and judging every thought that crosses our minds, while at any moment he that giveth can taketh it all away. These views if believed and harbored upon fervently may make a sane person psychotic. The fear of God is incited within each of us, and we are told that we are worthless sinning machines that basically do not deserve his gracious love. In fact, to most of us, this god seems distant, high up there beyond the clouds, and he often turns a deaf ear to our pleas and desires. But this is not Meister Eckhart's view and interpretation of religion. In fact, his God is always present, never far away from us. It depends on our willingness and decision to have contact and a personal relationship with him. All this time he is always there, either inside of us or at the door, waiting for us to invite him in. And he would never refuse an invitation even if it came from the lowliest and most sinful persons. Eckhart's views on sin are not tragic, heavy or pessimistic compared to mainstream religion. God is both fair and loving and looks beyond the multitude of sins we may have committed. In fact, the most important thing is to be at peace with oneself and to disregard sins, acts of repentance, and atonement. Even a sinner or criminal who fully accepts their punishment as fair and just is blessed in the eyes of Eckhart's God. Such a view is uplifting because it is all-embracing and inclusive. The focus here is less on one's actions, the Catholic idea of good works and acts of repentance, but rather one's inner life. It is there that one can have a meaningful relationship with God; it is there where the true Church of God exists within each living being. In fact, Eckhart's views are Buddhist when it comes to the sense of detachment. He says we need to be poor, not in terms of giving away all our wealth, but rather in spirit. We need to “empty” ourselves of all that is impeding a meaningful relationship with God, that could be, for instance, our own selfish wishes and desires, or our greediness and constant quest for pleasure and gratification; instead we ought to accept and fill ourselves to the brim with God. Because when we embrace God, our will unites in his. In a mystic sense, God and I become one, the same way husband and wife are meant to be of one flesh. In such a state, everything becomes a gift and a blessing of God, as he knows, tailors and measures everything, good and bad, according to each individual need and capacity. For example, not everyone is supposed to be or can be a saint. God will give you what you can handle and not overburden you with what is beyond your capabilities. We would need to accept and embrace what he gives us, both the good and bad because either becomes divine when it has come into contact with God. Eckhart gives a beautiful metaphor involving food. He says we may feel that certain food is good and bland according to our taste buds. But when you are imbued with the light of God, then your taste buds become like his and everything will “taste” divine. You will master bouts of suffering equally well and easily as you do with periods of happiness. Your feet may be grounded on the earth but the face of your spirit is always looking towards heaven. And this applies to every single human being on this planet. As we can see, Eckhart's view is of an upbeat, loving and personal God, someone who does not impose himself upon us, who does not burden us with rules and laws of obedience, someone who neither punishes nor strikes back. It is rather a God that is there for us in times of need and in times of happiness, who always has an open ear and heart to our conditions, and who is always and everlastingly present and close by. 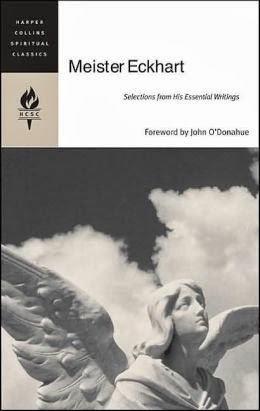 Postscript: It had been my intention to share this piece of writing with the late John O'Donahue, who apart from being a poet was also an expert in Eckhart's “cathedral of thought.” In fact, his foreword to Eckhart's collection of sermons that I was reading was impressive and put many of Eckhart's views in clear perspective urging me to want to share my ideas with him. Unfortunately, he has left us and all too soon. So I would like to dedicate this post to him. John claims that the soul is our “door to the divine,” and I believe that he has passed through it to be where the vast silence of Being is voiced. Very interesting, Arash. I think, well, 'real' Christianity is quite similar to this - unfortunately, the fundamentalists always have the loudest voices. It can be very difficult to overcome what we have been taught - God as angry about sins blah blah blah and etc. And the Old Testament seems to confirm a lot of that. Seems to apparently being the important part - in context and in the original language, it is much different (so I'm told by the scholars who are somehow able to weed through all of it). But damned if I know how to overcome what I was taught - I find reading the Bible exceedingly difficult - it generally just ticks me off. Sorry, bit of a tangent really. I wish we could throw out Christianity and start fresh without all of the preconceived blah blah blahs. Blah. Only Hebrew and Greek scholars would be allowed to teach what is in the Bible. Many of your posts seem to be about the Bible - does it interest you as an historical work or a literary work? Have you also studied the Koran? I would greatly enjoy reading your intellectual take on the Koran. I've become vaguely obsessed with the Mormons - I don't want to become one but I'm obscenely fascinated with their belief that 12 middle-aged/old white men are the only people who hear directly from God. The same I guess could be said of Catholics and the pope but Mormons seem to take it to a whole other level and they seem to twist themselves inside out to make sense of the often racist, sexist and homophobic words that come out of the 12 mouths. And why do they think the gospel had to be restored? It never died out I don't think. And Jesus popping into Missouri? Surely he'd pick the warmer climate of California. Sorry, another tangent.